Growth at BuilderTrend, an online building management firm, has been so steady that the Omaha-based company recently moved into their fourth headquarters in ten years. The former home of Vatterot College at 118th & I St. is the company’s new home, and we are excited to be a part of the transformation of the building. 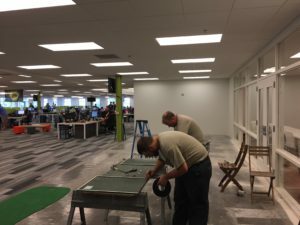 BuilderTrend has grown to more than 200 employees, and they needed a larger space. 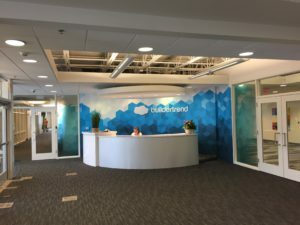 They incorporated an open design concept to encourage collaboration among employees and will allow the company to continue to grow in the space. Several glass features have been incorporated into the design that is transforming a former college building into a hip, exciting place to work. It has been a pleasure working with MCL Construction, the contractor for this renovation project. We have replaced the previous aluminum panels on the exterior of the building with 24 insulated glass units or varying sizes, using Energy Select Lowe over Gray Eclipse Advantage glass. This has dramatically changed the appearance and the amount of natural light that fills the building! 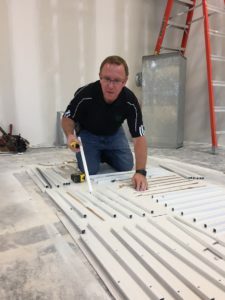 At this point in the project we have supplied over 500 square feet of Annealed Glass and 2,200 square feet of tempered glass, all ¼” thick clear glass to be installed into hollow metal frames in the interior of the building. We are excited to complete this project, and will share more updates and features with you soon!